(Nanowerk News) Scientists at Queen Mary University of London have found a way to place catalysts inside the tiniest pores of different host materials, a bit like when model ships are unfolded inside a bottle. Similarly, when a material is squeezed in a small space, its electrons are not free to move as far as usual and the material’s light emission colour could change – an effect that could be used in micro lasers. 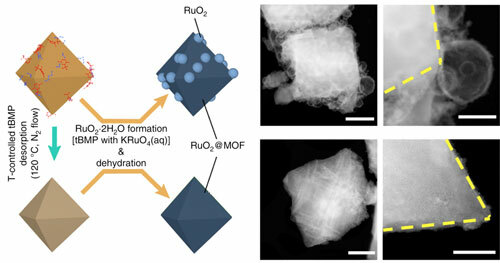 To illustrate the approach, the researchers used porous nanomaterials (metal-organic frameworks), which are like sponges but with 1 nm pockets inside where other molecules can fit. However, loading reactive catalysts inside a nanoporous host is challenging because often the reaction conditions can destroy the host. The study, published in Nature Communications ("Rational Approach to Guest Confinement inside MOF Cavities for Low-Temperature Catalysis"), demonstrates a concept which uses thermodynamics to overcome these issues. The researchers realised that they can estimate the stability of the host under various reaction conditions.